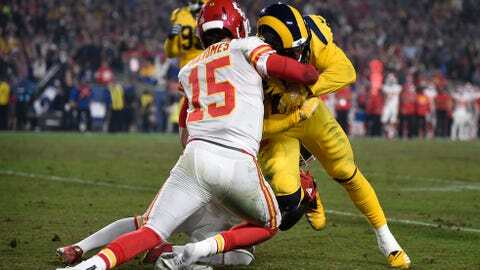 Patrick Mahomes is unable to keep Rams outside linebacker Samson Ebukam from scoring on a pick-six. KANSAS CITY, Mo. — Patrick Mahomes walked out of Los Angeles Memorial Coliseum 10 days ago with his jersey stained, his pride no doubt wounded and an uncharacteristic five turnovers blighting his box score. Despite his gunslinger reputation, he has continued to value possessions all season, throwing only 10 interceptions through the first 11 weeks. He also has lost seven fumbles, and that may ultimately be where experience will make the biggest difference. The Patriots‘ Tom Brady has six games with four interceptions during a career that will likely land him in the Hall of Fame. Ben Roethlisberger once tossed five for Pittsburgh against Jacksonville. The difference in some of those dismal days by some of the NFL’s best quarterbacks? They didn’t also throw for nearly 500 yards with six touchdown passes in a game they nearly won.